Showing 1 - 20 of 126 results. 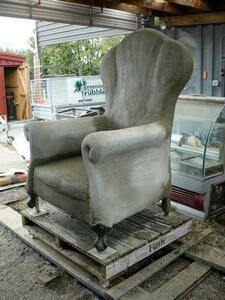 A photograph of Crack'd for Christchurch's partially-constructed armchair artwork. 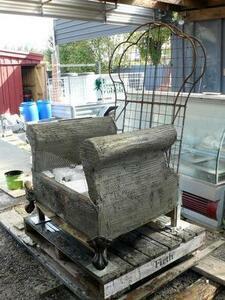 The armchair is on a pallet in Greening the Rubble's workshop. 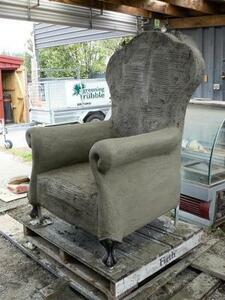 Jonathan Hall has moulded polystyrene, wood, mesh, and concrete over the steel frame to construct the armchair. Two cast-iron bath feet have been attached to the front legs. A photograph of the steel frame of Crack'd for Christchurch's armchair artwork. The frame is on a pallet in the Greening the Rubble workshop. Two cast-iron bath feet have been attached to the front legs. The bottom half of the frame has been covered with mesh, wood, polystyrene, and concrete by Jonathan Hall. 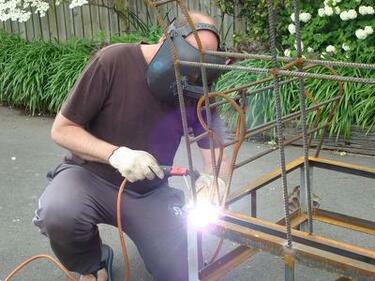 A photograph of Steven Cooper welding the steel frame of Crack'd for Christchurch's armchair artwork. 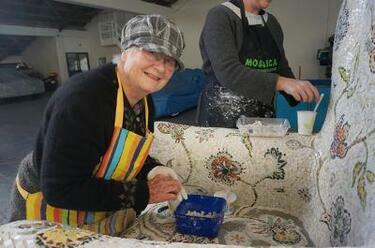 A photograph of Marie Hudson working on Crack'd for Christchurch's armchair artwork. 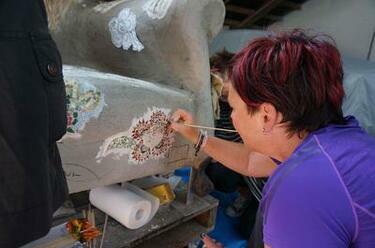 A photograph of Jayne White removing excess adhesive from between the tiles of a flower mosaic. 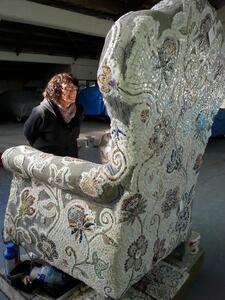 The flower mosaic is part of Crack'd for Christchurch's armchair artwork. 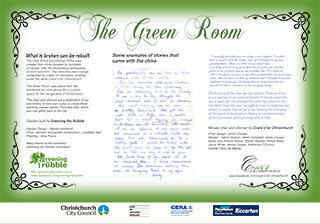 Crack'd for Christchurch comments, "A tedious process." 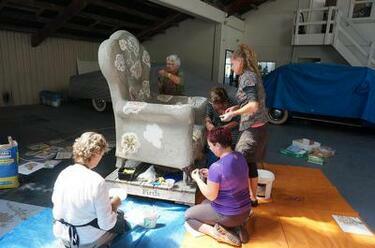 A photograph of Helen Campbell and Marie Hudson working on Crack'd for Christchurch's armchair artwork. A photograph of members of Crack'd for Christchurch taking a break. 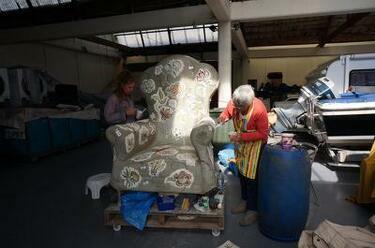 The team have been working on their armchair artwork in a garage. Crack'd for Christchurch comments, "February 2014. The work continues through the summer and into the winter. From left: Jayne White, Marie Hudson, Jennie Cooper, and Helen Campbell." 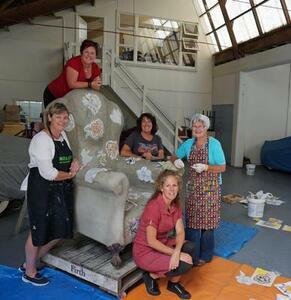 A photograph of members of Crack'd for Christchurch posing around their armchair artwork. Crack'd for Christchurch comments, "February 2014. 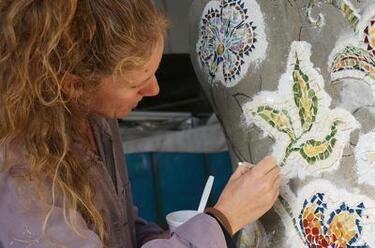 The work continues through the summer and into the winter. From left: Jennie Cooper, Jayne White, Jenny Cooper, Marie Hudson, and Helen Campbell." Crack'd for Christchurch comments, "February 2014. The work continues through the summer and into the winter. 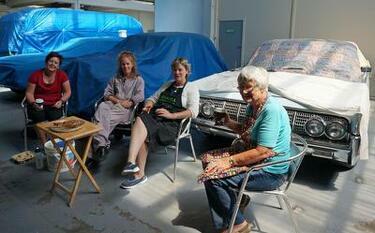 From left: Jennie Cooper, Helen Campbell, Jayne White, Sharon Wilson, and Marie Hudson." 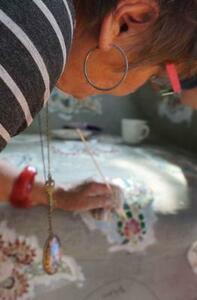 A photograph of Sharon Wilson removing excess adhesive from between the tiles of a flower mosaic. 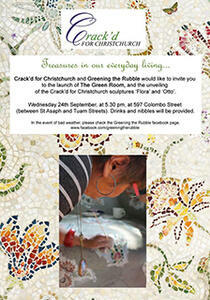 The flower mosaic is part of Crack'd for Christchurch's armchair artwork. 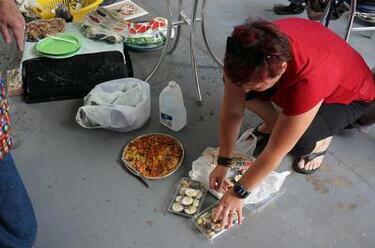 A photograph of Jayne White preparing lunch for the Crack'd for Christchurch team. 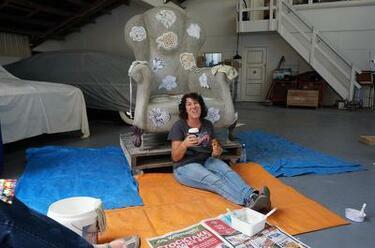 The team are working on their armchair artwork in a garage. Crack'd for Christchurch comments, "February 2014. The work continues through the summer and into winter." 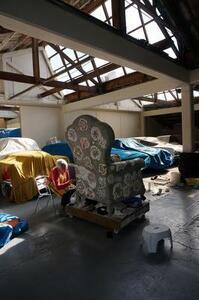 A photograph of Jenny Cooper taking a break in front of the Crack'd for Christchurch armchair artwork. 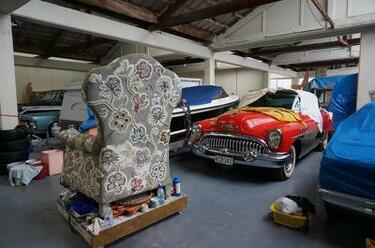 The Crack'd for Christchurch team have been working on the artwork in a garage. Crack'd for Christchurch comments, "February 2014. The work continues through the summer and into the winter."